U.S. Federal Aviation Administration has approved aircraft parts manufactured in India for use by manufacturers in the U.S. The certification supports the ‘Make in India’ initiative in the Indian Aerospace Sector. UTC Aerospace Systems announced on 4th February, that the United States Federal Aviation Administration (FAA) has officially approved a product manufactured by UTC Aerospace Systems affiliate entity in Bengaluru, India. With this approval, the Bengaluru unit is among the first Indian entities to domestically produce and export an aviation product to aircraft manufacturers in the United States. 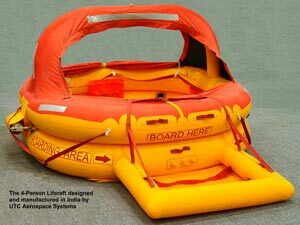 The approved product is a four-person Life-Raft. The compact, lightweight raft enables passengers and crew in the aircraft to evacuate in case of an emergency landing on water. “This announcement further supports industry in India by focusing attention on the benefits of manufacturing in-country, and highlighting the success of the ‘Make in India’ initiative to a global audience,” added Chris Rao, Vice President, UTC Aerospace Systems (India). The India facility in Bengaluru was established in 1997 with 12 employees, to provide MRO support for aircraft evacuation systems to airlines in India and the Middle East. Today it is a 2400+ strong organisation housed at two locations in Whitefield, Bengaluru, and is an integrated manufacturing, engineering and sourcing hub for UTC Aerospace Systems. Products being built in India include aircraft evacuation systems, aircraft interior and exterior lighting, cargo systems, pilot and cabin attendant seats, flight control motors, actuation systems and sensor systems. Additionally, the Engineering Center at the facility provides engineering support to all businesses of UTC Aerospace Systems.